We’re proud to announce the recent launch of Air Designs‘ new website! This was a really fun project to work on and a ton of great features were coded. Air Designs is one of Hollywood’s leading Set Dressing and Property warehouses. There inventory spans thousands of items and they needed a cutting edge website that: (1) made it easy for them to list their inventory and attributes; (2) easy for clients to search their inventory and (3) a way for clients to save inventory items to a “Wishlist” and then print or email that list. Custom designed website that embodied the client’s input plus our expect knowledge. Inventory management system with an easy interface for the client to maintain. AJAX search functionality that populates possible items while typing in the query to the search box — just like Google. 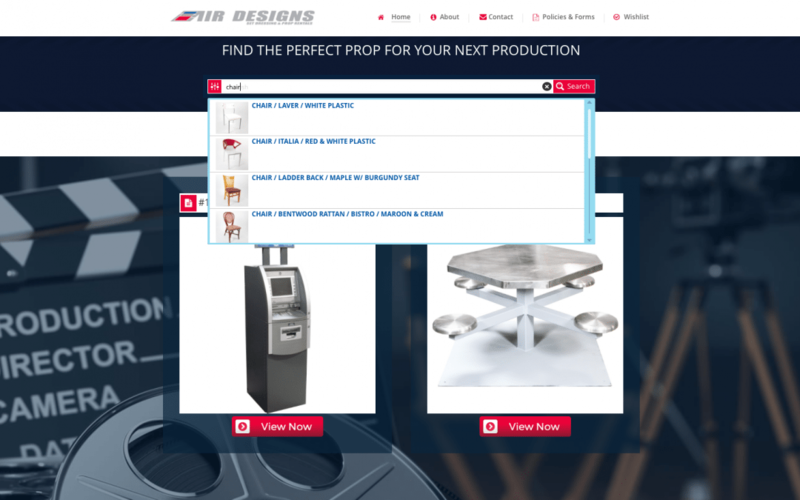 When viewing an item, the user is also presented with custom related items. Searching for a chair? The entire matching dining room set will populate with it. Custom “Wishlist” feature that allows clients to save inventory items for email or printing. Document database that houses the various forms and disclaimers the company uses.